This sweet and easy workshop is the perfect and fun taste-test in the art of Calligraphy. At the end of the workshop you’ll be able to write a word by yourself, and you will know some basics in Calligraphy concepts and practice. 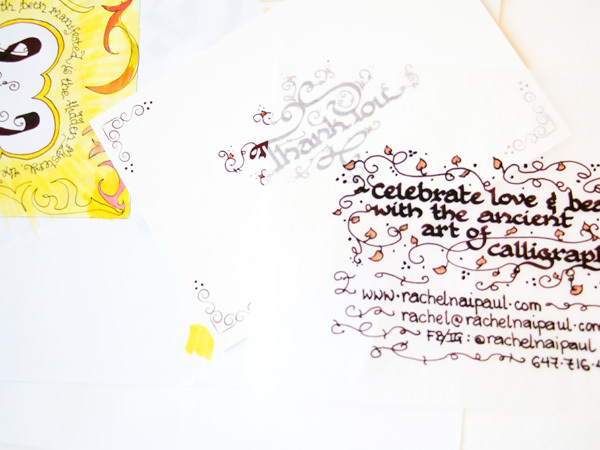 Rachel is a professional Calligrapher and taught herself traditional Gothic Calligraphy when she was a bored 13 year old equipped with a calligraphy set, and promptly fell in love with the art. A decade later, after working as a Mehndi Artist, her foundation in traditional Gothic Calligraphy transformed into a fusion of West meets East: a firm foundation of European Gothic Calligraphy blended with intricate, colourful, sparkly Indian, a whimsical font that no one else possesses. Rachel currently teaches her style of whimsical Gothic Calligraphy, in a fun and friendly setting, and continues her art by creating special orders for clients.